The National Council of Churches in the Philippines (NCCP) calls for prayer, lament and solidarity with Palestine as we witness the response of the Israeli security forces to the legitimate protests of the Palestinian people. We are reminded that the fruit of violence is violence, and we pray desperately for justice and peace. 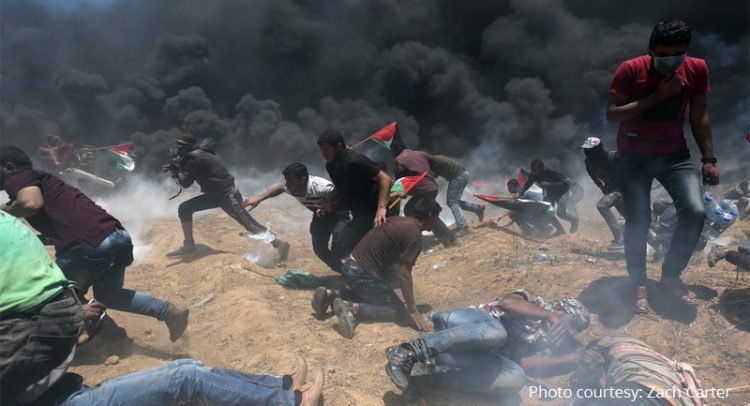 With horror and sadness, we watched the scenes unfolding in Gaza as the Palestinian people desperate for justice threw stones and burned tires and were met with the excessive and brutal response of Israel’s security forces. The suppression of protests with the slaughter of people, including children, and aerial bombardments of tear gas are completely out of proportion to any threat presented by the protesters. The current protests of the Palestinian people and the excessive, repressive response of the Israeli government need to be seen in the context of the long years of land theft, denial of basic services and the failure of Israel and the international community to come to a justice settlement with the Palestinian people. The policies of Israel that have resulted in occupation, displacements and virtual apartheid are leading to what can only be regarded as genocide. The effective siege under which Israel has placed the Palestinian people of the Gaza strip must come to an end. Furthermore, the NCCP expresses its solidarity with the Palestinian Christian churches and people of good conscience throughout the world, in condemning the intensified repression and aggression of the State of Israel. President Donald Trump has destroyed any US pretensions to being an “honest broker” of peace. His actions and policies have shown the US to be an oppressor of the Palestinian people. We are appalled by the way in which these insensitivities displayed by the Trump administration have inflamed the conflict and encouraged Israel to act with impunity and engage in even more extreme repression. The Palestinian people are rightly concerned that Israel will continue to find ways to weaken Palestinian control over their land and property. They are rightly concerned that Jerusalem, which has for millennia been a city holy to Palestinian Christians and Muslims as well as Jews, will be subject to policies of displacement and apartheid that the state of Israel has enacted in the Palestinian territories. However, rather than heed this warning, the USA has set out to intentionally inflame conflict. The day of the opening of the new US embassy was timed to coincide with the day of nakba, which marks the day in 1948 when over 750,000 Palestinians were expelled from their homes and made refugees. After 70 years of bloodshed, displacement and the struggle of the Palestinian people to return to their homes, property and land, the United States chose this day deliberately. This cynical act by the United States, the emboldening of the State of Israel to increase the intensity of its repression against the Palestinian people, and the support that the Duterte regime in the Philippines has given to provoking unrest by the presence of the Philippine ambassador at the official ceremonies in Jerusalem (while many countries intentionally did not attend the ceremonies) must all be condemned. We are saddened but not surprised by official support extended by the Philippine government to US provocations and Israeli repression because it reflects so closely the state repression of indigenous and Moro peoples undertaken by the Duterte regime here in the Philippines. As Jesus approached Jerusalem and saw the city, he wept over it and said, “If you, even you, had only known on this day what would bring you peace—but now it is hidden from your eyes.” (Luke 19:41) The NCCP calls its member churches and all people of faith at this critical time to pray and act, and implore to God to bring sight to those blinded by violence and open for them the ways of peace.